"There is always some obstacle to overcome." Something will destroy the world--it's inevitable. Whether that something is man-made or not remains to be seen, but people will be forced to adapt in order to survive. That adaptation takes on an interesting form in The Threat #1 from Stratum Comics. The issue is written by Mark Schmidt and Vince Chuter, illustrated by Jodri Perez Estevez, colored by Philip Fuller and lettered by Schmidt. After a societally devastating event in 2024, humanity must fight to survive and rebuild from the ashes of past. As the world crumbled, one man’s vision brought his society back from the brink and created a spectacular new city and a new seat of power for the United States rose in Houston, Texas. A group of people trying to survive everyday life are forced to defend themselves against the new order and in doing so may become the city’s last hope of survival. To say that The Threat #1 is pretty bleak would be an understatement. Schmidt and Chuter infuse the book with a pervasive sense of dread, as each event seems to be tied to something larger and none of it is very promising or cheerful. That larger force at play is essentially a corporation, as the writing duo have essentially further embellished the anti-corporation sentiment that's gained steam over the past few years. There's a disconnect though in the "everyday" people and those with an advantage because of those same corporations. It's a little disjointed in terms of what exactly is going on and how events are playing out; it feels as if Schmidt and Chuter have the concept in their minds, but the translation to the reader is a little rough around the edges. Many of the characters in feel rigid. Estevez uses a style that presents characters struggling to portray a sense of kineticism--it's almost as if all the characters are stuck on the page. Additionally, a lot of the characters seem to have the same facial expression of consternation throughout much of the action, regardless of whether or not the situation warrants such an expression. Backgrounds are sparsely detailed, which does little to provide context for the story itself. The gutters vary in their fill and colors, which is somewhat distracting at points as the colors often conflict with Fuller's colors. The Threat #1 is pretty ambitious, but it feels as if it bit off a bit more than it can chew. There's a culturally relevant story in there somewhere, but the quick jumping between characters makes that story a little difficult to suss out. Schmidt and Chuter's script is paced pretty unevenly with dialogue exchanges that are a little clunky at times. The artwork by Estevez boasts some character models that look relatively impressive, even if the artwork overall is a little inconsistent. 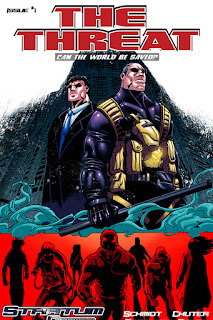 The Threat #1 offers normals turned superheroes fighting against a rapidly changing world with a story that has potential to get more interesting if some minor flaws are ironed out. The Threat #1 has a Kickstarter running for the series reboot.